so said ellie: A question for you? When I lived in university housing, we would get letters about random things from the housing manager all. the. time. 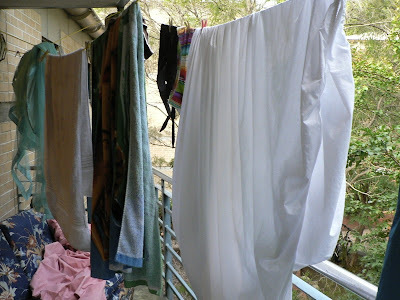 That man loved sending letters, and we mostly loved ignoring them, which is why we always had laundry on the balcony. Having laundry on the balcony was most definitely Not Allowed. Hah. Anyway, we always suspected that man was a doofus, and that was before I lost part of my bond when I moved out. Which, for the record, was to pay for the $78 "cleaning fee" required when he inspected my room and found that it still contained 3 wire coat-hangers, a plastic bag, and a pencil. The horrors. If you have any further questions, please do not hesitate to call me?